Although you may not spend a lot of time thinking about volcanoes, these geologic features impact our daily lives in many ways - especially in Oregon and the rest of the Pacific Northwest. The spectacular volcanoes of the Cascades provide exceptional wildlife habitat, recreational opportunities, and natural resources. The high elevation of the Cascades plays a major role in determining climate differences between temperate rainforests on the west side of the range and arid high deserts on the east side. Volcanoes can also be dangerous. Lava flows can bury roads, houses, and everything else in their path. Volcanic ash can cause severe problems for transportation, agriculture, drinking water supplies, and air quality. Volcanic gasses can be deadly to breathe, and they can alter global atmospheric conditions and climate. For these reasons, it is important to study volcanoes and to be prepared for future volcanic activity. Become familiar with volcanic products and processes. Learn about the active volcanoes of the Cascade Mountains. Understand the hazards posed by active volcanoes. Gain an appreciation for the impact of volcanic activity on human history. Understand the risks and benefits of living in close proximity to potentially active volcanoes. This course is designed for people with little or no background in geology. We will cover the basics of how and why volcanoes erupt, and the deposits they produce. 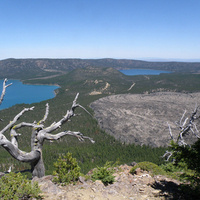 Participants with previous knowledge of geology and geologic process will broaden their understanding of the volcanic history of Central Oregon, and of volcanoes in general. Registration is required; payment will be due at the time of registration.